Maybe you know a Marjorie Moore; maybe you are one. She’s dauntless, desperate, and a little bit delusional. In her debut novel, Manhattan-based writer Christie Grotheim delves deep into the American heartland to explore a flawed search for fulfillment. Her lovable protagonist’s insatiable desires and misguided antics shed light on our own search for escapes—and search for self—and perhaps that is why we cheer her on wholeheartedly. ﻿Question - Please describe what the book is about. 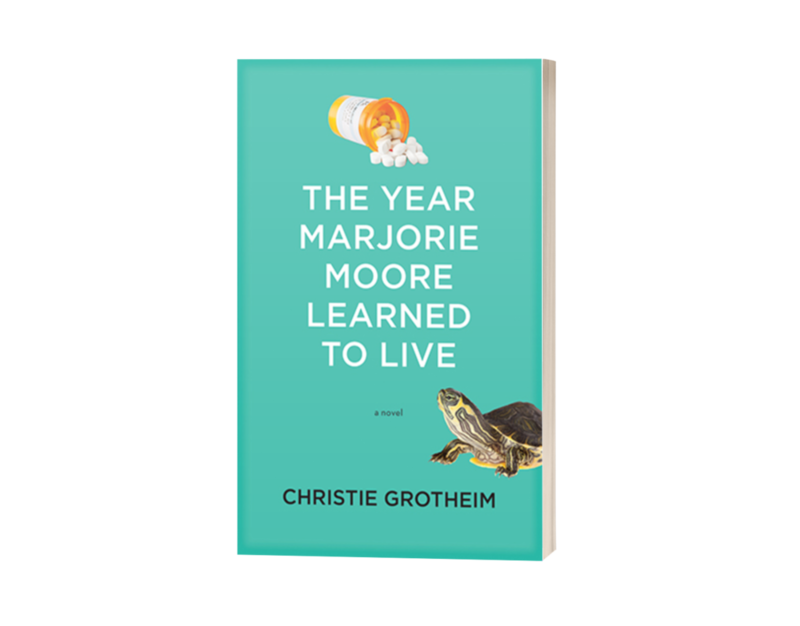 Christie Grotheim – Forever searching elsewhere, Marjorie Moore is consumed with wanting, or in her opinion, needing. Feeling trapped by her town and her family, she escapes through obsessive shopping, pill popping, and fantasizing about a possible affair with a friend from high school with whom she reconnects on Facebook. Her growing credit card debt “forces” her to sell prescription drugs—which she secures at her receptionist job at the local hospital—to her dysfunctional friends. As her web of lies at home and work unravels, Margie wrestles with whether she is capable of becoming present in her own life. Q - Share a teaser from your book. CG – Introducing Marjorie Moore, a deluded dreamer whose hunger for more triggers an epic midlife crisis—and yet somehow we still root for her! Her insatiable desires and misguided antics shed light on our own search for escapes—and search for self—and perhaps that is why we cheer her on wholeheartedly. CG – Marjorie Moore is a flawed protagonist who is always searching elsewhere, for otherness, and I have known people like that in my life both in Dallas and here in New York. I feel it’s a very unhealthy outlook, and I wanted to explore this theme through Margie’s search for fulfillment. I wanted to create a satirical character that we could laugh at a little—but relate to, and I found myself relating to her more than I cared to admit: my way of rationalizing things, my own search for escapes, my own struggle to be present in the moment. CG – I came up with the title early on, and it just stuck! I liked the alliteration, and it became even more meaningful when I realized at the time I wrote the novel, I too was learning how to live. I was reevaluating how I spent my time and who I spent it with; where I find joy, and what I value. There are a lot of ways we relearn to live, and Margie’s story is just one of them, but I believe it will resonate with many different people on many different paths. CG – My favorite character, if of course, Margie herself: I tried to create a character who was human, quirky and real. The challenge was creating a flawed protagonist who was a bit desperate and delusional, but still relatable, so it was important for me to make her authentic and give her depth. Q - Are your character based on real people, or do they come from your imagination? CG – I do find I can create more realistic characters by pulling from people I know: the mannerisms of one, the looks from a couple of others, certain characteristics of another. I use the amalgam as a starting point that is then evolved and is developed until they become their own being, and I as a writer have a complete unique image of them in my mind. Marjorie Moore really came alive for me, and then took on a life of her own, driving the character-driven plot forward. Q - Tell us about why you chose the setting of your novel. CG – I feel that my novel could have taken place almost anywhere: in middle-America or New York City, but I chose a place I know well, as a kind of homage to Texas. I grew up in Longview, went to college at TCU in Fort Worth, and lived in Dallas for a few years before moving to NYC. Until recently, my sister lived in Flower Mound, which the suburb Prairie Mound is based on—but unlike Marjorie Moore, I found it quite charming. I wanted to be able to recapture and describe the landscapes, the smells, and other details that reminded me of my childhood. CG – The entire process has taken about five years. The saga of Marjorie Moore started as a short story in a 92Y workshop with Adam Langer. The class’s enthusiastic response inspired me to write a few chapters of a novel after the workshop ended, which I then set aside to focus on graphic design—and paying the bills. I picked it up a year and a half later—and liked what I read—and felt the novel had momentum, and that the message was relevant enough to continue. I pushed forward full-force, taking another class at the 92Y with Sandra Newman, where I continued developing the novel and workshopping chapters. I worked hard on the novel the entire year until I had a tight manuscript to query. The query process took nine months, and while I mostly queried agents, I approached one small press, Heliotrope Books, who took on the project—and we finally signed a book deal in November 2017. The publication process took a year and a half, leading up to the thrilling release date of April 2nd! CG – Not much deep research was required of this book, other than referencing visuals of the towns mentioned, like Paris, TX. Prairie Mound is a fictional town, combining two suburbs I know well: Grand Prairie and Flower Mound. And I had to double-check pop culture referenced in the book, to make sure it was in keeping with the timeline of the book, since Margie is a few years younger than I am myself. CG – While certain scenes were certainly streamlined and cut down, I did more building and expanding than removing, for example, adding depth of character through more backstory and specific memories from Margie’s troubled childhood. CG – I’m a little bit of both. I’m not into methodical plotting because this is not the main draw for me when I read. I can read about any subject and be carried through any plot if the prose is beautifully written. But when I write I do have a sense of the ending, and the themes I want to convey. And I do utilize outlines of chapters, and scenes and objectives within each chapter, which helps me with pacing, character development, and the character-driven plot. CG – I like getting into the zone and writing for hours uninterrupted, getting lost in a scene or description as I conceive it. I also enjoy refining on a sentence and paragraph level, massaging the language when I already have something on the page to play with. I don’t mind further edits because I like how it can lead to something new—a new line of funny dialogue or a better metaphor. For me writing is like reading: I love getting lost in another world, but it’s even more exciting because it’s one that I am creating. CG – I believe the most challenging part of writing, like any art, is knowing when it’s complete. Knowing when continuing to edit no longer improves it, trusting when you as an artist feel that it’s finished, and having the confidence to let it go and release it into the world. CG – Since I’m a freelance graphic designer, I can’t write every day. But my ideal routine is getting up relatively early and diving in, before the stress of the day is allowed to enter my mind, and writing at least four hours, which for me is ideal, sometimes extending to six or eight if I’m really in the zone. I try to write in blocks of time, blocking off three days or a week in between design projects. CG – I rarely get writer’s block, and I have found the best way to overcome it is to force myself to sit down and continue, knowing that I will almost always get past it within fifteen or thirty minutes. CG – I never thought I could write a novel. Perhaps because of the great literature that I read and love, I felt maybe I wasn’t intelligent enough, that my vocabulary wasn’t broad enough. At the time I started writing I was obsessed with David Sedaris, Jonathan Ames, and Augusten Burroughs. And I had an epiphany: this is not rocket science—they are merely putting one sentence after the other, using language within my capacity. They had a voice and a point of view. Since I felt the personal essay form was more approachable, I allowed myself to write, word by word, sentence by sentence, and found that I too had a voice. So I would tell myself: Christie, push past your fears and insecurities, and allow yourself to write. CG – I have to sit Indian style, cross-legged hunched over on my sofa, to the detriment of my aching back and neck! CG – My husband is a musician, and we both love to create. He is one of my most trusted readers and a great editor! CG – I like being surrounded by nature and art, whether that is through travel or hiking in Central Park or going to museums and exhibits in the city. I try to let myself be inspired by other types of beauty and art that will hopefully find itself into my pages. CG – I’ve been writing headlines, taglines and blocks of copy for years, within my graphic design work. I’ve been writing creative non-fiction and humorous personal essays for a decade. While I’m mostly focused on my fiction now, I try to write a few new humor essays, to break things up and practice the craft. CG – There is no one book that influenced me the most, but some of my favorite writers are: Martin Amis, John Irving, David Sedaris, Jonathan Franzen, Jeffrey Euginides, Vladimir Nabokov, Milan Kundera, Anthony Doerr, Barbara Kingsolver, David Foster Wallace, and Marilynne Robinson—to name a few! I have been moved and inspired by so many writers over the years. CG – I’m working hard on my second novel, A Ballad in Cobalt Blue; I’m deep into it and kind of obsessed with it right now: it’s my very heart and soul. I find pouring myself into it relieves the anxiety I feel about marketing my current book, uses a completely different energy, so it allows for balance and an escape from this exciting but intense process! CG – One of the best pieces I received, from Jonathan Ames who was kind enough to read one of my essays when I was just starting out after I randomly sent him an email. His thoughtful response: “I really enjoyed your story. Keep writing! And remember to make every sentence entertain!” I have taken that to heart, and feel it’s great advice. There is no room and no place for a boring sentence. CG – Right now, I’m reading advanced reader copies of noels from fellow debut authors with books coming out this year, and I’m really enjoying them. There are so many unique and talented voices coming out this year! Of the books I read this summer, my two favorites books were Manhattan Beach by Jennifer Egan and Wild by Cheryl Strayed, and my absolute top two books that I’ve read in the last five years are The Poisonwood Bible by Barbara Kingsolver and All the Light We Cannot See by Anthony Doerr. And I try to squeeze in some classics; the last two that struck a chord with me were 1984 and The House of Mirth. Christie Grotheim is a New York-based writer whose stories have been featured in Salon, The New York Observer, and Mr. Beller’s Neighborhood. Grotheim studied creative writing at the New School and the 92nd Street Y, where Marjorie Moore was conceived, and birthed a few years later as her debut novel. More of her published writing can be found on www.christiegrotheim.com. Follow her at @cgrotheim on Twitter and @christiegrotheim on Instagram.